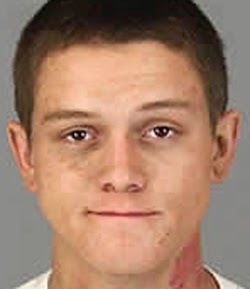 Police today released the booking photo for the suspect in a high-speed chase that resulted in a traffic accident and closure of Highway 79 in Temecula on Friday, March 13. Rico Robles, 23, of Anza was treated for injuries and booked into Southwest Detention Center after crashing the Ford pickup truck he was driving into a Cadillac sedan near the intersection of Highway 79 and Sage Road Friday afternoon. He faces charges including felony evading, felon in possession of ammunition, committing a felony while on bail, felony driving under the influence and causing an injury collision, possession of a controlled substance, and parole violation. The incident began at 1:20 p.m. when a Temecula Police Department motor officer observed the pickup truck traveling southbound on Jefferson Avenue at excessive speeds. The officer approached the speeding vehicle in order to conduct a traffic stop as the Ford began to swerve in and out of lanes and drive through intersections against red signals. The officer attempted to conduct a traffic stop but the truck failed to yield, police said. A pursuit was initiated. The Ford truck continued to flee southbound and eastbound on city streets, passing through additional intersections with red traffic signals and failing to maintain his lane. The pursuit eventually reached Butterfield Stage Road, where the Ford turned and drove south to Temecula Parkway. The pursuit continued east and past the city limits, ultimately ending when the driver crossed into opposing traffic and struck a Cadillac sedan near the intersection of Highway 79 South and Sage Road. Two occupants of the Cadillac, a male adult and a female adult, were transported to a local hospital for treatment of moderate injuries. The suspect fled on foot into a canyon area adjacent to the crash scene. Pursuing officers, along with Riverside County Sheriff’s deputies, located and apprehended Robles after a brief foot chase. Both eastbound and westbound traffic on Highway 79 South were shut down for an extended period of time due to a vehicle fire that resulted from the collision. The fire caused multiple secondary explosions within the suspect vehicle. Those were believed to have been caused by both live ammunition and canisters or tanks in the vehicle, police said. Riverside County Fire personnel responded to extinguish the fire. Arson Investigators responded to inspect the suspect vehicle for additional explosion hazards. Once investigators determined it was safe to do so, the vehicles were removed and both lanes of traffic were reopened.